Some new Fire Emblem Warriors details have been leaked and subsequently translated by our member on the forums Torii. History mode also has Thabes tower from Shadow Dragon being teased as one of the maps. 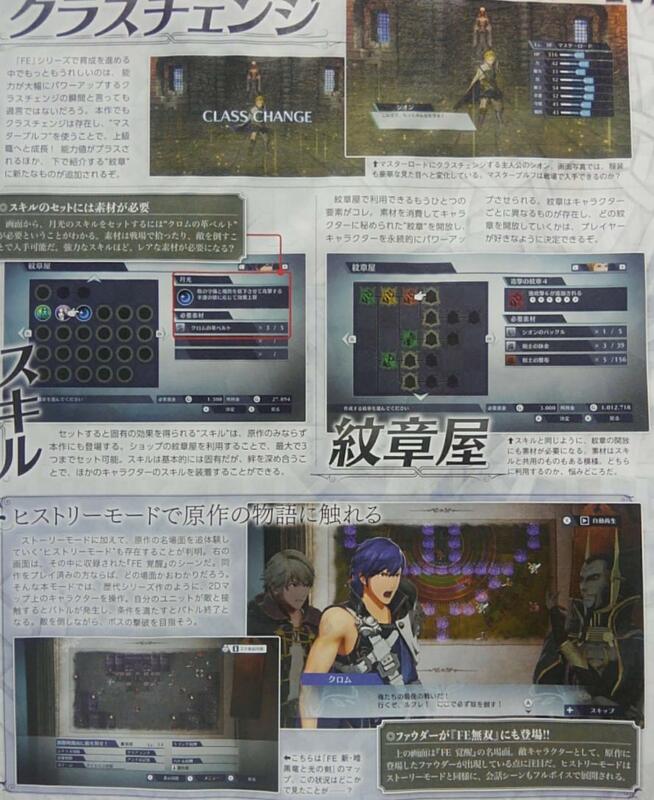 Validar is shown and is now confirmed to be an enemy NPC, more details at the bottom. This is actually like a mode I wanted in the game in the first place. Rowan getting a lance is cool, I wonder if Lianna uses an axe or also a lance? Skills being like this is certainly interesting, but works for a game like this, usually they are equipped on your weapons in Warriors games, but this probably works for the better since we’re going to be switching weapons a bit. Stay tuned for even more details on the 7th as before. Oh, I love the idea of the History Mode (as a Spanish user I hope how the mode will be called as History and Story use the same word in Spanish, “Historia”). I also love the skill system, and the return of the character progression with badges from HW. It also seems that finally we get the “multiweapon” characters with this class changes (maybe their denial was for the base classes). However, I prefer 1000 times Walhart… but probably Validar was the most “consistent” option (also it WILL be playable, as Ganondorf, Zant and Ghirahim are playable characters in Hyrule Warriors). Warriors games have had bosses who weren’t playable at all before, which is why I’m cautious to just straight out say its like Hyrule Warriors in this case quite yet. Fire Emblem Warriors is following many steps of Hyrule Warriors (maybe because to ensure their fans into this new crossover, maybe because being the second Nintendo crossover with Warriors), so I assume this won’t be different (as they also confirmed the badges from HW). Obviously, you’re writting a news post, so you can’t put personal opinions, but I used my “normal user superpowers” (XD) to say my personal opinion. Obviously can be the chance of not being playable, but considering is the only sorcerer confirmed so far and (again, in my opinion) add a potential playable character only as a boss would be ridiculous I think Validar is 99% probable to be a playable character. Haha normal person powers are nice! Honestly I do think you have a solid line of thought here. Validar is the most logical option for an Awakening villain, IMO. Wouldn’t mind Aversa coming alongside him, think it would make sense. Do we have reason to believe that the 25 character thing is a hard limit? Maybe they won’t make cards for all the characters. It’s just a theory at the moment, we can’t really be sure until we’re given more information on that. My guess is that the 25 character limit is for the heroes and not the villains. So I imagine that vanilla FE Warriors will have 25 heroes and how ever many villains, with all the villains hopefully being playable. I’d also like Aversa too, which isn’t out of the realm of possibilities since it seems vanilla is only going to have 3 games with representation. I think this doesn’t change anything. Again with Hyrule Warriors, we had Cia, Volga and Wizzro as unplayable bosses, but later they were playable as a free DLC soon after the game launch. Also, in the video Koei Tecmo used to reveal playable enemies, they revealed first the characters and after the capability of play with them (from the beginning). I’m still sure Validar (and the other bosses they’ll reveal) will be playable (and most likely from launch). Again, is a prediction that can fail, but I still think this changes nothing (is quite probable the article refers to his appearance in this mode). Yeah I just like things being accurate to what is said for the time being, just me being me haha, I know the HW trends. Hearing all this stuff is a big relief. Really hope they make some villains playable either here or in the dlc, especially the Black knight. Give me the Black knight!!! Can’t have the Black Knight if even Ike’s not here, and at this rate it would be a godsend if he’s in the base game. Yeah I meant in dlc. And it would be pretty foolish to not put out a lot of dlc for this game like they did with Hyrule warriors. How many DLC characters were there in Hyrule Warriors? IIRC around a dozen? Sorry, I didn’t really follow the DLCs to closely in that game. If they put out around the same amount, I’d say that’s roughly only enough to cover the main lords of the older games. If I remember correctly the original game had 16 and the dlc added 13. But it also added new weapons and thus completely new movesets for existing characters (which I doubt they will put in the dlc this time around). Also fe has waaayyy more potential characters than Zelda (really felt like they needed to scrape the barrel sometimes for the dlc). So I’m hoping that they double the amount of characters or close to it. In before someone make jokes about how you need Chrom’s Leather Belt to craft Luna. Love skills from Awakening/Fates I miss them since echoes SoV! Looking at the picture, seems that Promoting doesn’t reset the character’s Level. Does this mean that by playing history mode we’ll be basically playing a remake of awakening, fates and possibly shadow dragon? If so, then I’m game!